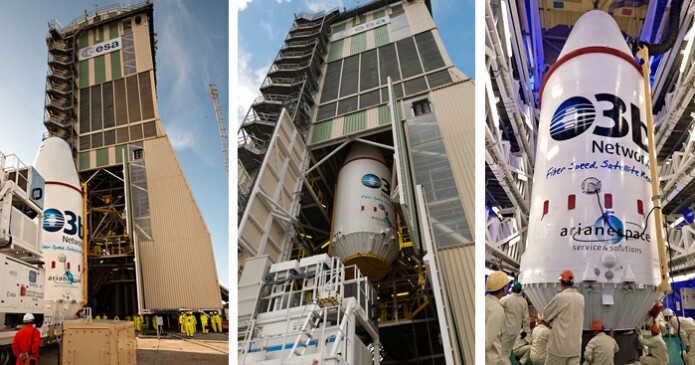 Arianespace’s second Soyuz launch at the service of O3b Networks has been approved for liftoff tomorrow from the Spaceport in French Guiana on a flight to complete the basic satellite constellation for this customer’s pioneering connectivity service. The medium-lift mission will loft four relay spacecraft that are to join an initial four orbited by Arianespace on a Soyuz launch in June 2013. These eight satellites will constitute the network framework to provide fast, flexible and affordable connectivity for O3b Networks customers in emerging markets. Today’s go-ahead for Flight VS08 was given following the readiness review, a regular milestone before every Arianespace mission, which validated the go-status of Soyuz and its satellite payload, along with the Spaceport’s launch site infrastructure and the ground stations that will track the mission. After deployment by Soyuz, the four Thales Alenia Space-produced satellites – each with a liftoff mass of approximately 700 kg. – will be located at a medium-orbit altitude of 8,062 km. Tomorrow’s mission will be the eighth flight by Arianespace’s medium-lift Soyuz from the Spaceport, where it was introduced in 2011 to join the company’s heavy-lift Ariane 5 and lightweight Vega.